Tea Party Express Vll national bus tour has added a new feature — a Mobile Phone Bank Bus which gives Tea Party groups an opportunity to make calls to Wisconsin voters for the June 5th recall election. 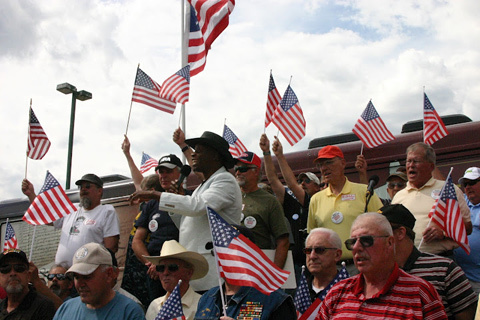 The first rally of Tea Party Express Vll was Friday, June 1st in Jefferson, WI. The rally was great. The mainstream media would like you to believe the Tea Party movement is dead. Such is not the case. The movement has become far more sophisticated over that last 3 ½ years. Starting 3 or 4 Tea Party Express national bus tours ago, I began meeting more and more patriots who are working; involved in local and national races, publishing books, releasing songs, producing videos and movies, organizing to cover weak spots in our armor, educating themselves and others — everyone passionately doing their part to restore America. Local tea party leader Pam Schoenecker and her group hosted our rally in Rhinelander, WI. Pam is a wife and mother of five. She runs 5 facebook pages in support of Gov. Walker. Groups on facebook: Let's March for Governor Scott Walker and Keep Politics Out of the Classroom. Open Pages: Let's March for Scott Walker, Women for Walker and Green Lake County Republican Party. At our Tea Party Express rally in Green Bay, WI, I met William Berglund who is Chairman of Republican Party of Door County. I asked William if he is seeing signs of the Tea Party losing energy in his county. William said, "Quite the opposite." His headquarters usually answer requests for around 200 lawn signs max. So far, they have met requests for over 900, "I Stand With Scott Walker" signs. William said patriots in his county are fired-up like never before. William Berglund's report confirms what I have been witnessing in my travels on Tea Party Express VII across Wisconsin. The Tea Party is alive, well and extremely active. For the grand finale of every rally, I invite all of the veterans in the audience to join me on stage while I sing "God Bless The USA." Of course, no visit to Green Bay, WI which is famed for cheese would be complete without trying a cheese I have never tasted before — Jalapeno Cheddar Cheese Curd. Delicious! I expect a deliciously awesome win for Gov. Scott Walker on Tuesday.